Sword made in Muromachi period Eisho. This sword belongs to regular ranking. 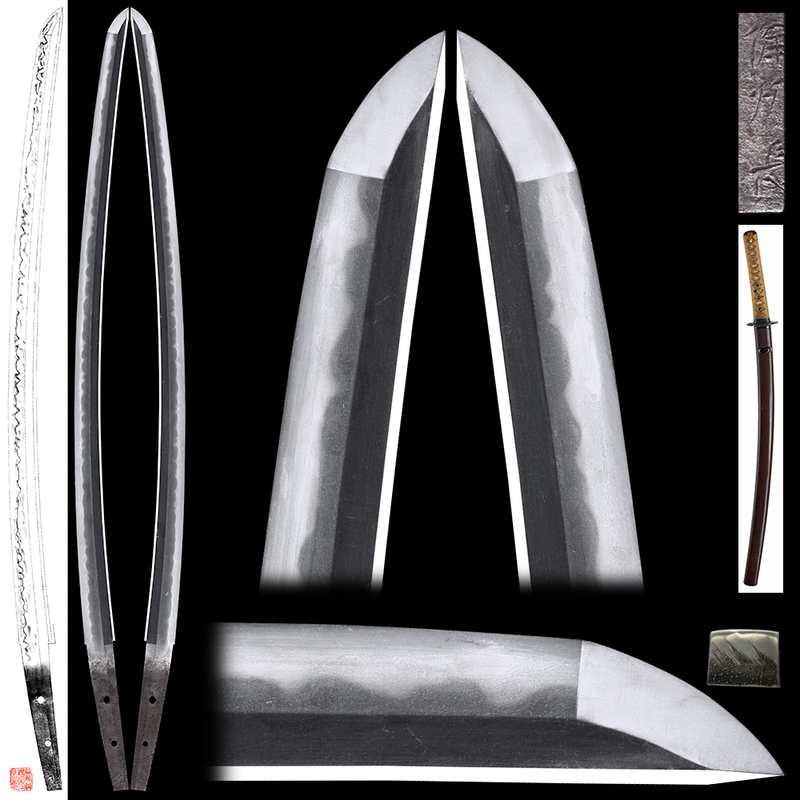 Blade length :　59.37　cm or 23.4 inches. Sori : 2.25 cm or 0.89 inches. Width at the Kissaki : 1.84 cm or 0.72 inches. Shape : Bishu Osafune signature left on nakago after suriage. Jigane : Mokumehada mixed in Koitamehada with Utsuri. Hamon : Nioi-deki choshi midare sharp Gonome mixed, double Hamon from Monouchi to kissaki. Sunagashi, Kinsuji appear and Turns back sharply. Mokumehada mixed in Koitamehada with Utsuri, seems to be Bizen Jigane of eisho. Signed as Bisho Osafune but seems to be Sukesada. Saya : Dark brown Ishime-saya. Tsuba : Mokko shape iron tsuba colored with gold. Menuki : Plum lower engraved on Shakudo plate, colored with gold. Fuchikashira : Wave engraved on Shakudo plate.